IC63 (the bright, pointed object near the middle of the image) and IC59 (the weaker object near the upper left portion of the image) are collectively known as Sharpless 2-185 (Sh 2-185). They are both illuminated by the B0 IV star , Gamma Cas, which is off the top left portion of the image. The lone diffraction spike (not a satellite track) originates from this magnitude 2.5 star. It was left in this image deliberately. Both nebulae are close to this ionizing star at about 190 pc, but have very different visual appearances. IC63 can be referred to as a "cometary cloud", is pointing toward Gamma Cas, and is narrower and more sharply defined than IC59. Spectral measurements suggest that IC59 is slightly cooler at 590K and less dense than IC63 at 630K. They are not separate nebulae, but are part of a much larger nebulous region surrounding Gamma Cas based upon the WHAM (Wisconsin H-alpha Mapper) survey that is approximately 2 degrees in size. 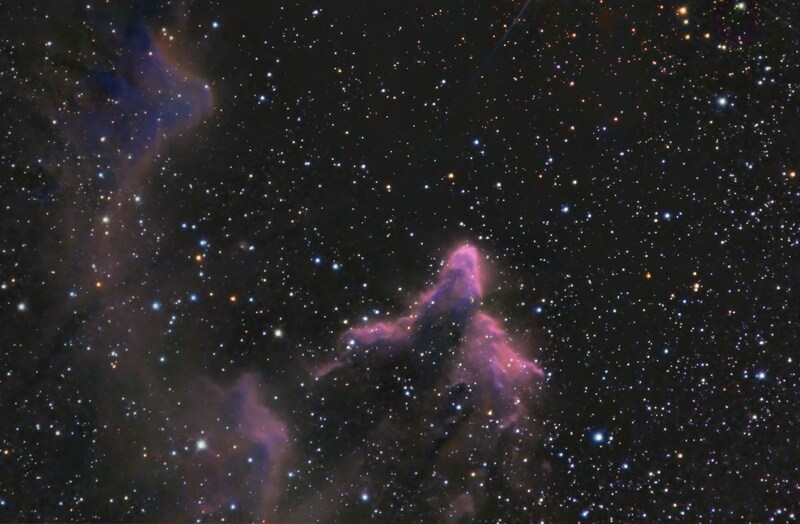 IC63 has bright filaments, clearly shown in my images above, that are suggested by Karr et. al to be ionized fronts of gas created by Gamma Cas, and seen by us as nearly edge-on. Both nebulae exhibit spectroscopic evidence from the mid-infrared of molecular hydrogen and polycyclic aromatic hydrocarbons (PAH). In summary, the contrast in appearance between IC63 and IC59 is consistent with a difference in actual distances from Gamma Cas and small differences in temperature and column density.